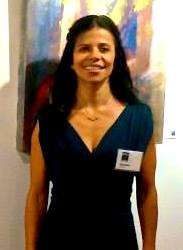 Colombian born artist, trained as a Petroleum Engineer. She studied art with several artist, both in Canada and Brazil. She has exhibited in Canada, Brazil, and California and currently in Houston, where she has her studio. She has received several awards both locally and abroad. She is an active member of several art organizations. She is also a poetry writer which she sometimes incorporates into her paintings. CALGARY SCHOOL OF ART, Calgary, Canada 2010. She is a member of The Oil and Acrylic Painters of America, the Women Artist of America, The Artist of Texas and the Women in the Visual and Literary Arts. Recently, she was awarded four ribbons (1st, 2nd and two honorary ) in the 2013 LSAG convention.